If you have any kind of freezer space, no matter how small, you can save money in your food budget by buying some foods in the large #10 cans (just under a gallon). Where to shop: Besides whole sale clubs, many grocery store chains either have a dedicated aisle to #10 cans or they are often found on the bottom shelves. Other places to look are thrift grocery stores which specialize in dented cans and mark downs such as Big Lot and Ollies here in Virginia. Storage options: The key to saving money is to open up the can and divide it into freezer containers and freeze the portions. 1) Plastic freezer bags. These are space saving. Lay them flat to freeze. and then once frozen you can stack them on top of each other. You can rewash most of these bags and reuse them again. This option is perfect for small freezer spaces. You'll be amazed at how little room some sandwich bags or quart bags take up once they are stacked! Jan's Tip:Lay a flattened cereal box down first if you have a wire rack in your freezer, that way the bags don't sag through the wires and get stuck while freezing! Or, use a cookie sheet. to flash freeze the bags individually first, before stacking them. If you stack them before they are frozen the bags will stick together. 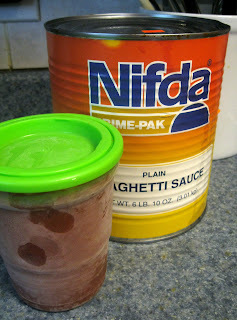 2) Plastic freezer containers: I use a set of Ball freezer jars I picked up in the canning department of Walmart. They are great. I can reuse them over and over, they microwave well, when I need them at the last moment, and I know the lid is on tight. Remember to leave room for expansion during the freezing process. 3) Canning jars. Yep. Glass Canning jars. Regular canning jars usually freeze very well and the new boxes at the stores should be marked "freezer safe" right on the box! There is no need to water bath seal them at all, just pop on a canning lid and ring or Ball makes a new plastic lids for just this purpose in the canning department. remember to leave a little room for expansion, during the freezing process. What to freeze: Almost anything! I prefer to buy in bulk things I use often: such as diced tomatoes, pizza sauce, tomato sauces, vegetables, refried beans, and you can freeze some fruit. With the vegetables, during the beginning of fall, often I will buy cans of carrots, diced potatoes, corn, green beans etc. and then open them all up and premix them together for a "soup" mix. Then I can just toss one into the crock pot or sauce pan with other ingredients to make things like: vegetable beef soup, taco soup, stew, etc.